This wall hanging has a wood burn inspired deer design with a tree line silhouette. Colors are natural tones of browns, tans and black. This wall hanging has a wood burn inspired deer design with a tree line silhouette. 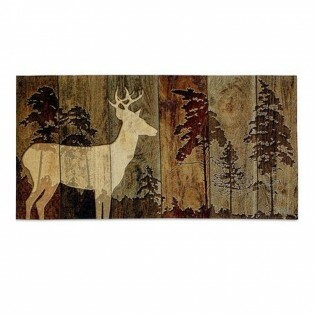 Colors included on the Woodburn Lodge Deer Wall Hanging are natural tones of browns, tans and black.